This sample freebie from our full Tongue Twister pack pronunciation unit has everything you need to sample what our full pack offers to teach students the correct pronunciation necessary to be academically successful in English. 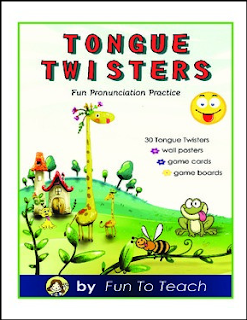 This is a sample of our full pack of Tongue Twisters – Pronunciation Made Fun which contains 30 traditional tongue twisters to help elementary students master English pronunciation! Wall posters and game cards are provided for your students to practice the sounds of English with these engaging tongue twisters. Practice English pronunciation with fun activities and game boards. **Thank you so much for your purchase! If you enjoy my products, you can follow me and/or visit the Fun To Teach blog! Thanks a bunch! Click the green star beside my name at the top of this page OR at the top of my store page. Following me notifies you when I post a new item.